Last night my wife and I were able to watch the season and series final of 24, the final (or not so final) adventures of Jack Bauer. We have watched every season of 24, although mostly via DVD, and loved the first 4 or 5 seasons. Jack Bauer and President Palmer were fantastic characters, well acted, that you rooted for. Toss in Chloe in Season 3 and it was great. 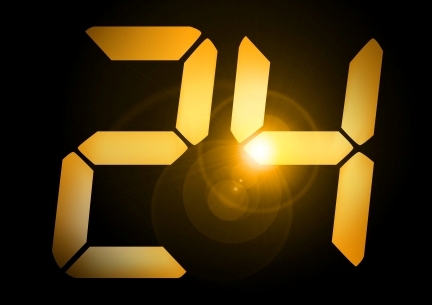 This series was a really unique concept – 24 episodes attempting to countdown 24 hours in real time. But you can only do that for so long when you just know Jack Bauer is not going to die and you know they only have 24 hrs to resolve it. You know that after 12 hours, the first baddie’s boss is going to emerge and the next 12 hours will be about stopping him instead. You know that the first plot to blow up NY or kill the president is going to be replaced by yet another crazier plot or high-level conspiracy. There stops being very much at stake when it seems like no one else beside Jack can really die either (see: Tony Almeida). The last couple of seasons my wife and I stuck with it but it was a show that my wife would just sleep through most of the time. But I really wanted to see it end and that is one reason why I kept engaging with 24. Enter Season 8 of 24. I had no idea this was the last season of the series. I don’t follow entertainment news. We don’t watch 24 on TV, we watch it online on Hulu. So when Jack’s girlfriend gets killed around episode 16 or so and he starts to spiral downward even further to where there’s no coming back, basically entering the “Tyson Zone”, I wondered just what was going on. Finally, after episode 22, I caught that it was the final series and it all made sense. Heading into the Finale, I had high hopes. I hoped for either a redemptive death of Jack Bauer or a redemptive death of another significant character (like Chloe) for Jack. Maybe that was asking too much but if you watch, you know it was heading there, all signs pointed to something significant, a change of direction, an end. Then I heard that there was the potential for a 24 movie and I knew Jack couldn’t die – yet again. Sure enough, Jack walks away at the end of the finale in a very anticlimactic way setting up the movie. I wanted redemption for Jack and Pres. Taylor’s confession and repentance was not enough for me, especially since the Satan-like Logan is probably still alive and justice isn’t close to being done.